See what kind of savings you can get now in 23 states. Organic yellow nectarines and peaches: $1.99/lb., save $2/lb. Made-in-house pork sausage, no antibiotics: $3.99/lb., save $3/lb. Wild, sustainably caught yellowfin tuna steaks: $15.99/lb., save $9/lb. Prime members will also be privy to 50 percent off self-serve tea cookies by the pound on June 15, plus an additional 10 percent off hundreds of sale items throughout the store every day. Click to see other ways to save money at Whole Foods. To take advantage of exclusive discounts, Prime members must download the Whole Foods app. 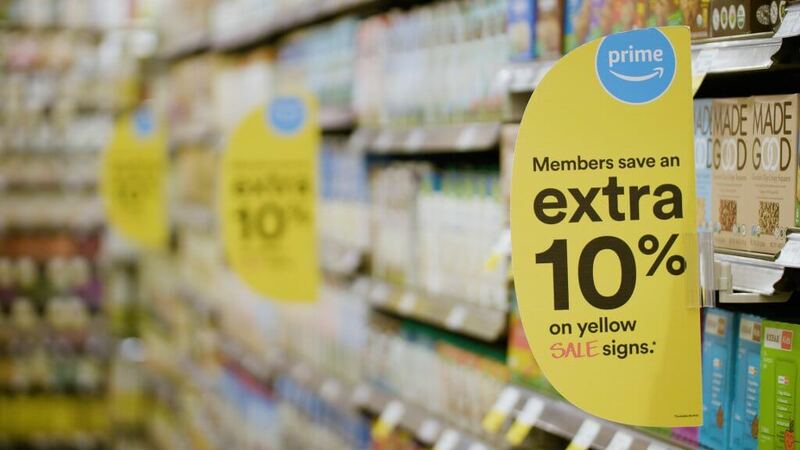 While shopping, Prime members should keep their eyes peeled for large signs indicating “Prime Member Deal” or signaling an extra 10 percent off. Upon checkout, members will scan their Prime code on the app to save. In mid-May, grocery savings became available in all Florida-based Whole Foods stores with the plan to extend to all Whole Foods Market and Whole Foods Market 365 stores nationwide this summer. Prime members can expect in-store deals similar to the savings Florida shoppers started receiving, like $2 off a pound of organic strawberries, 50 percent off 16 ounces of cold-brew coffee at Allegro coffee bars, and buy one, get one free 12-packs of 365 Everyday Value sparkling water. The new Whole Foods discount offerings for Prime members is the latest move in expanding the Amazon-Whole Foods universe. Earlier this year, the companies launched free two-hour delivery on Whole Foods Market groceries through Prime Now in 10 cities, with more to come this year. Amazon Prime Rewards Visa cardholders can rack up additional savings at Whole Foods with 5 percent back on purchases. For Whole Foods, the discounts could signal a significant boost in shoppers. Of the 100 million Prime members, less than 20 percent are Whole Foods shoppers, whereas about 75 percent of Whole Foods shoppers are Prime members, CNBC reported. Perhaps Prime members will consider the Whole Foods discounts a justification for Amazon’s annual Prime membership hike to $119 from $99 earlier this year. Click to keep reading about brilliantly slick ways to get Amazon Prime for free. A cheap way to drink nice wine? This guy is all in.